Proving that despite the state of the economy there will always be collectors and fans with deep pockets that simply "must have" an item that only comes around once in a lifetime. In this case it's Yogi Berra's World Series Worn Jersey from Don Larsen's perfect game. 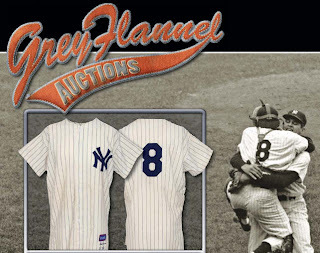 Bidding closed today at a staggering $564,930 at Grey Flannel Auctions. This level of memorabilia makes our $50k shopping spree look like a joke considering the amount spent on this single item could have been used to fulfill the dream lists of 101 bloggers/collectors.